A stunningly illustrated introduction to our planet's many frog species! Frogs, frogs, and more frogs! This exciting survey of the world's frog species will introduce children to varieties as diverse as the golden poison frog (the planet's most toxic animal), the Amau frog (so tiny it's no bigger than a housefly), and the Chinese gliding frog (which can "fly" up to 17 feet)! Their different hunting techniques, preferred foods, body types, and methods of defense are covered, as are the universal basics of the frog life cycle. 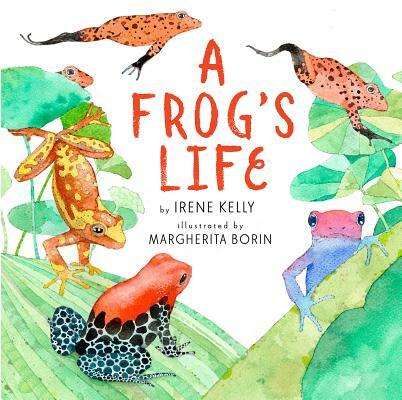 Colorful, scientifically accurate illustration is paired with a distinguished nonfiction writer's plain, energetic text in this excellent introduction to the diversity and fundamentals of frogs. Back matter includes information on frog disappearances and conservation efforts. A Cybils Awards Finalist in the Elementary Nonfiction category! IRENE KELLY writes nonfiction for children. Her books have been named Outstanding Science Trade Books by the National Science Teachers Association and the Children's Book Council and have also been named to the John Burroughs List of Nature Books for Young Readers. MARGHERITA BORIN is an Italian artist specializing in lifelike wildlife illustration.